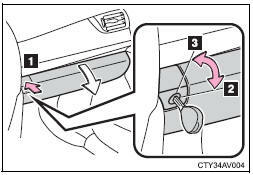 The glove box can be opened by pressing the lock release button, locked and unlocked using the master key (vehicles without a smart key system) or the mechanical key (vehicles with a smart key system). ■Caution while driving Keep the glove box closed. In the event of sudden braking or sudden swerving, an accident may occur due to an occupant being struck by the open glove box or the items stored inside.